Add salt, pepper powder and chili powder to it and mix well. Heat a non stick pan and pour some oil. Now dip a slice of bread in egg mixture to coat it evenly from both sides. Now place coated bread slice on pan and cook on medium flame. When lower side is cooked and become golden, flip it and cook another side. Flip it once again and cook for few seconds. Switch of the flame. 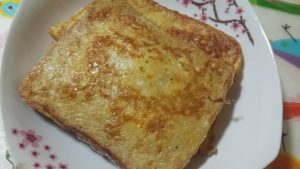 French toast is ready. Serve hot.